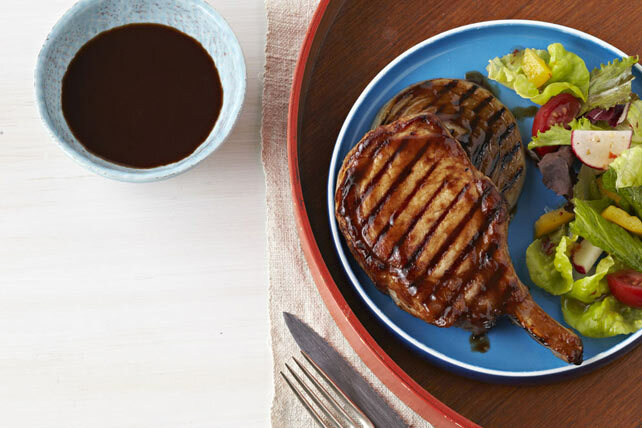 A duo of cola and KRAFT BBQ Sauce team up to make a delectably sweet and sticky sauce for these succulent grilled chops. Bring cola, barbecue sauce and garlic to boil in saucepan; simmer on medium-low heat 12 to 15 min. or until thickened, stirring occasionally. Reserve 1/2 cup sauce to serve with the grilled chops. Heat barbecue to medium-high heat. Grill chops and onions 12 to 15 min. or until chops are done (160ºF) and onions are tender, turning after 8 min. and brushing with remaining sauce for the last 5 min. Serve chops with onions and reserved sauce mixture. Perfect grill marks start with a clean barbecue. To clean a gas grill, close the lid of the grill and heat on HIGH about 10 min. to burn away the excess food residue. Then, turn off the heat and use a long-handled wire brush to scrub the grates clean. Clean charcoal grills while they are still hot. Use a long-handled wire brush to scrub the grill grates clean.